Formulating your own moisturizer is inexpensive and easy, and it's a great way to ensure that you're putting only natural ingredients on your skin. What's more, there is no need for special equipment, and you may already have the ingredients in your kitchen. If not, you can easily find them at your local health food store. Both of the simple homemade moisturizer options presented here are gentle enough to use every day, and they won't break your budget. As an added bonus, they can be customized to fit your needs. Fill the bottle 2/3 of the way up with either the argan oil or jojoba oil. Add the evening primrose oil almost to the top, leaving a little room. 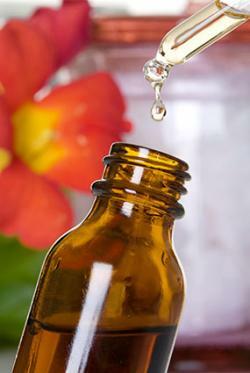 Using the eyedropper, add 4-7 drops of either chamomile or lemongrass oil. After each drop, cap and shake. As you sample your formula, you may choose to add or delete ingredients in your next batch. There is no wrong way to make this moisturizer; all the ingredients can be used alone or together. Storing your moisturizer is easy. Keep it in a cool, dry place with the top closed, and it will stay fresh for 8-12 months. Combine all ingredients in the Mason jar. Add a couple of inches of water to the saucepan and heat on medium. Put the Mason jar in the saucepan and place the lid loosely on top. As the ingredients start to melt, stir or shake the jar gently so all the ingredients blend together. After everything is fully melted, pour the mixture into a tin or jar. Note: A pump bottle will not work with this formula. Store your moisturizer in a glass jar or tin with a lid, and keep it in a dry, cool place. Kept properly, this homemade moisturizer will last 6 months. Developing your own moisturizer has many possibilities. Since formulating is so easy and affordable, it only makes sense to make your own blend. Be creative and search for unique bottles or tins to store your concoctions. You can even make special blends for friends and relatives. Get started and enjoy your moisturizing mission!